Mum tries very hard to keep me off of the counters when she is cooking. But I likes to be there and help. Here I am checking that she gotted all of the stuff out of the can and into the cooking thing. But mum didn't appreciate my help. 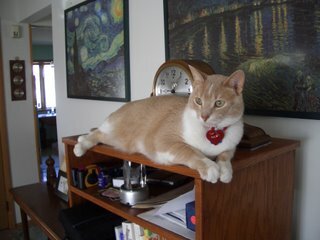 So I will just sit on top of the book thingy that tells her what to do. She will have to ask for my help then. HEHEHE. 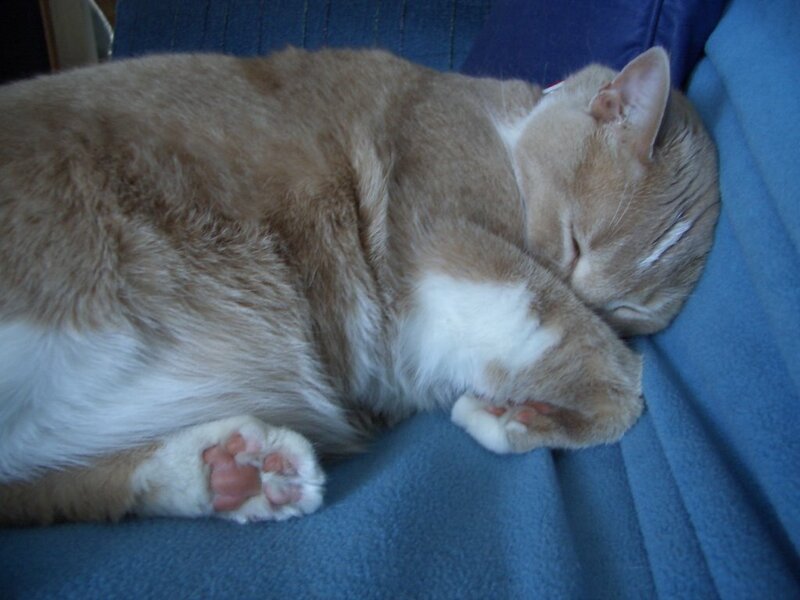 Hope all of my poodin furiends and beans have a safe holiday weekend in the US. The rest of you just have a safe weekend. What was so interesting outside? 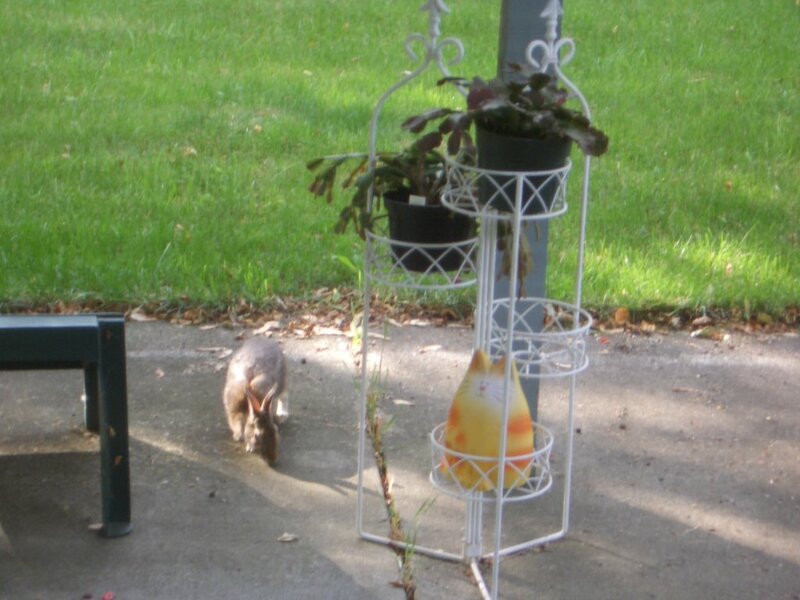 A little bun coming to visit with Vir-ginger. It has been a quiet day, mum came home and we snuggled for a while. 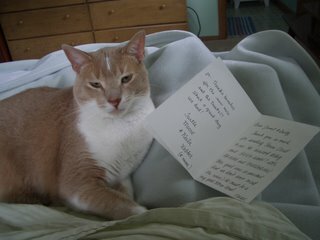 I was happy to have mum to snuggle with as we had some sad news about Tiffy from 5 Cat Style & The Flyer. 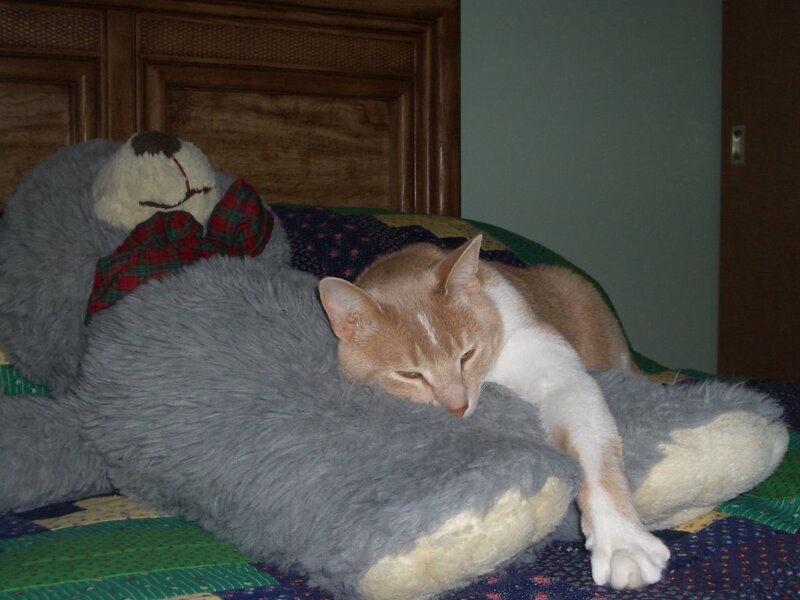 A sweet, young kittie wented to the Rainbow Bridge much sooner than would have been expected. Mum says thank you for the comments that she buys me cool stuff. Yes she does. Grampie says she spoils me and she agrees. She likes spoiling me. It is always nice to see what she finds me. Plus I know there is a package in the purresent closet that is something for me. But for some reason mum hasn't gotten it out for me. Some of mum's friends have woofies. She saw them a few weeks ago. This is Amber. She lived in Iowa with Dave and Sue. But she was getting old and went to the bridge last week. Mum says she was getting very skinny but her tummy was furry large. But mum says she was a very nice woofie and had a good trick. You could put a treat on her nose, and she would let it set there until given permission to eat it. Then she would flip it in the air and catch it and it eat. This is Smokey. He was a resque from a local shelter. He is a young and energetic little guy. So he gets lots of walks every day. He lives with mum's friends Gary and Jane. They have had both woofies and kitties over the years. I guess I will let mum have a few woofie friends, as long as they don't come and visit. My outside screen porch thingy came from Target. Its for woofies and can collapse for storage. So look in the woofie stuff it you wants one. 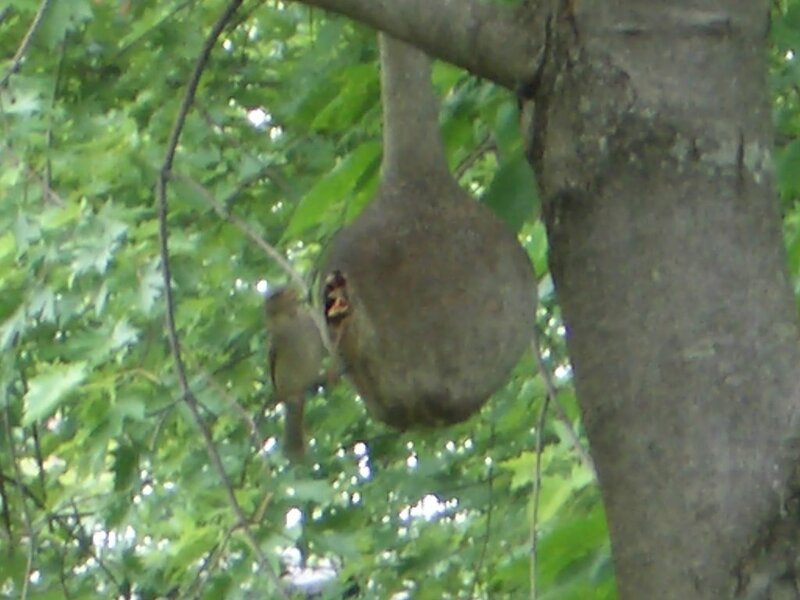 Mum gotted a picture of the baby birdies getting fed by their mum. They sure do make lots of noise for such little things. You can be inside and have the windows shut and still hear them getting excited when they get fed. 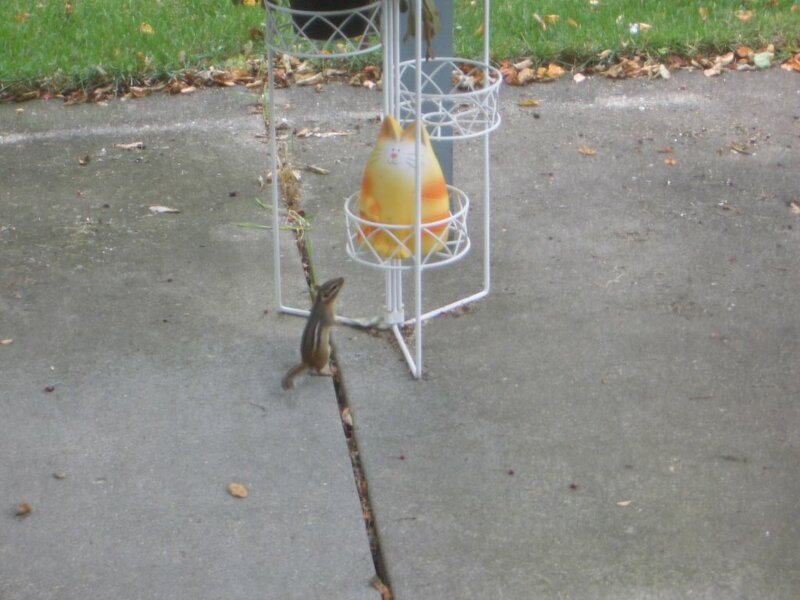 Then mum gotted a picture of one of the little chipmunks saying hello to Vir-ginger. Then the last thing that was outside was ME! Mum got this thingy that she put me in(I thinks it was meant for woofies), then took the whole thing outside for a while. She sat and readed her book, Vir-ginger and I chatted, watched the birdies at the feeder. I was maybe 6 feet from the feeder. I gotted a good laugh when a pigeon landed on the ground, took one look at me and took off again. I don't think he expected to see a kittie sitting there. I was thinking, yum. That pigeon would be a good size snack. Plus, things were purrty normal, and suddenly all of the birdies just scattered. Mum wented to look and we had a sharp-shinned hawk sitting on top of the electric pole just outside of our yard. Since the little birdies were safe he didn't stay long. And since I was inside my enclosure, he couldn't see me. So I was safe. Not sure if I like this thing. I do like being outside and I do have room to move around. I think mum likes it as I can't get away and I keep clean. About the mousie in the house the other night. It was over an hour from when I firsted started with pouncing/playing with it, to when mum killed it. She wanted to go to bed and wasn't going to bed knowing we had a live mousie running around. I gotted my first real post office mail with my name on it. I was so excited and wondered who it was from. Mum readed it to me and it was from Le Trois Chats, Turtle, Moose, Nala and their mum in Texas. It was a furry nice thank you note for Storm Cloud. No, thank you for adopting Storm Cloud. I guess I am rested up after the big adventure with Zeus yesterday. I gotted to see lots of things here in the state of Whiskerconsin. Yes, the place is lots more than beer, Packers and cheeseheads. If you come to visit, let us know. We can tell you fun places to see. Mum says Chatty Belle is near where Grampie lived when he was a little wafer. Plus uncles Flip and Stormy wented to Bucky's school. Mum considers herself an honorary Badger. I tried to rest up as best I could, but I also had my duty to help mum last night even though I was tired. We had a real live mousie in the house last night. I tried to get him caught and mum was trying to help me. But then it wented and hid in the corner behind the cabinet. But I stayed on watch, it finally came out and I got it chased into the bathroom. Mum closed the doors and she killed it. Yes, I must admit it, she killed the mousie not me. Mum says I was having far to much fun just playing and chasing it. Mum says I need to develop my killer instinct. Mum has been busy working outside early today. She gotted the grass cut off and the birdies all fed. 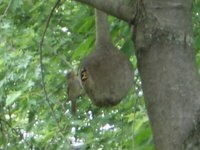 Plus we have baby birdies, both sparrows and wrens. They make lots of noisy as they wait for their mum's and dad's to bring them food. Plus mum had to refill the little sack with nesting stuff in it. That means the birdies are getting ready for another round of babies. Now it is raining very softly. Which means nice napping weather. Z z z z z z z z z. First Fat Eric has informed me that Mandy has arrived in her new home in London. No issues with getting into the country, so gues she can apply for catizenship after the waiting period. They are busy getting to know each other. Inky made it to The Tower Hill mob on Tuesday, so the only one not yet arrived is with Zeus. Maybe I can check with him directly has he will be here tomorrow. Tomorrow, Zeus is coming to visit Whiskerconsin. 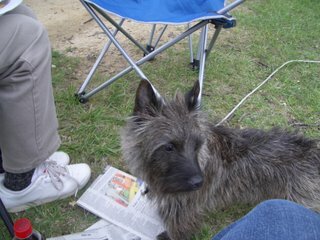 He will be in the Madison area to visit with Bonnie and Victor. Then head over towards the Milk-wau-kee area to see The Crew and me. I didn't get a chance to send the postcard, but maybe we could stop here before you head back to Texas. 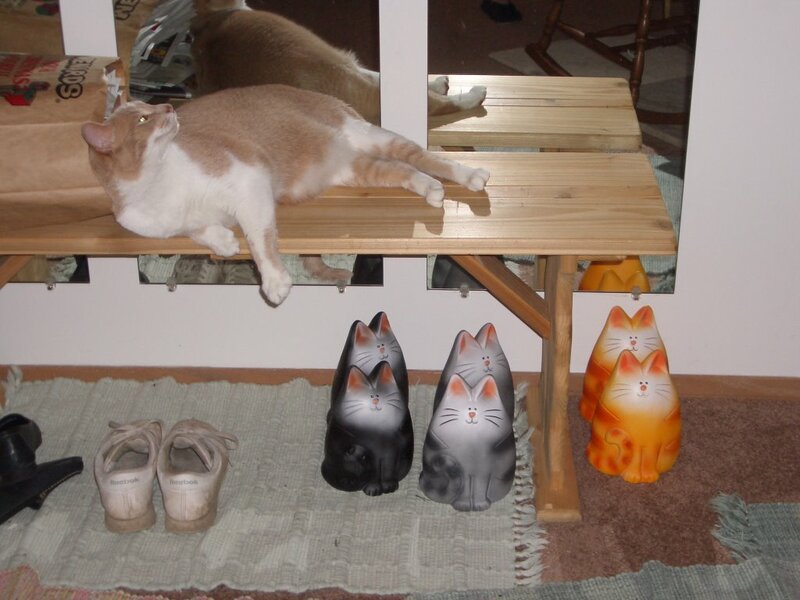 This place is south of the border, Illi-noisy, and maybe I can get some speed running tips for the next Catolympics from the horsies. Just so you know mum wented to this place yesterday for work. Well, work, but fun work. I don't know about that girl. She tries to make it out she works SOOOO hard, but then they have time for this? Mum says it is a chance to blow off steam before quarter close. Yeah, right. And no she didn't win lots of money betting. She only won $3 dollars, and she bet a little more than than. But she assures me she didn't lose my treat and toy money. OK, I need to get rested up for Zeus tomorrow. Bye. Mum gotted box a yesterday and when she opened it up it had stuff in it from the Catolympics. I didn't know she had even ordered this stuff and it came just after I had competed. 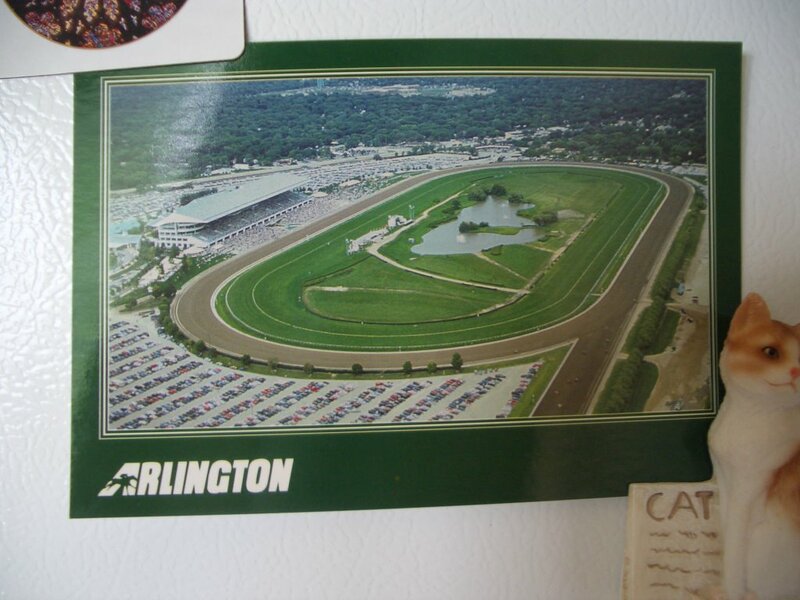 So the magnet is on the big cold box with the mini-me magnet. The clocky thing is outside so mum can check the time when she works in the yard. But then the box is fun too. 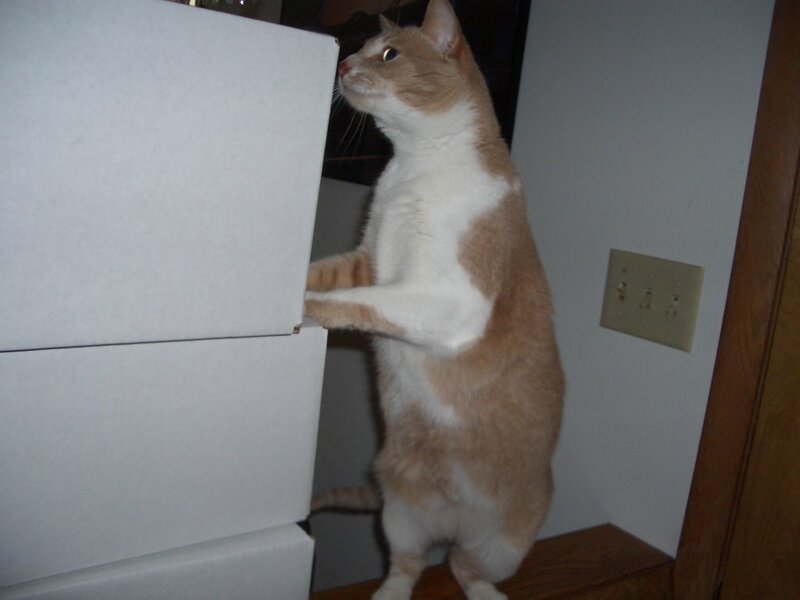 If I practice with this, maybe I could enter fitting into small boxes next Catolympics. Plus three of our foster kitties have arrived at their furrever homes. Mango, Ashes and Storm Cloud have made it. I have safely teleported back home. It is a rainy day here, not going to be 90 degrees today. Mum is in the dungeon with the big washy machine, making things clean. 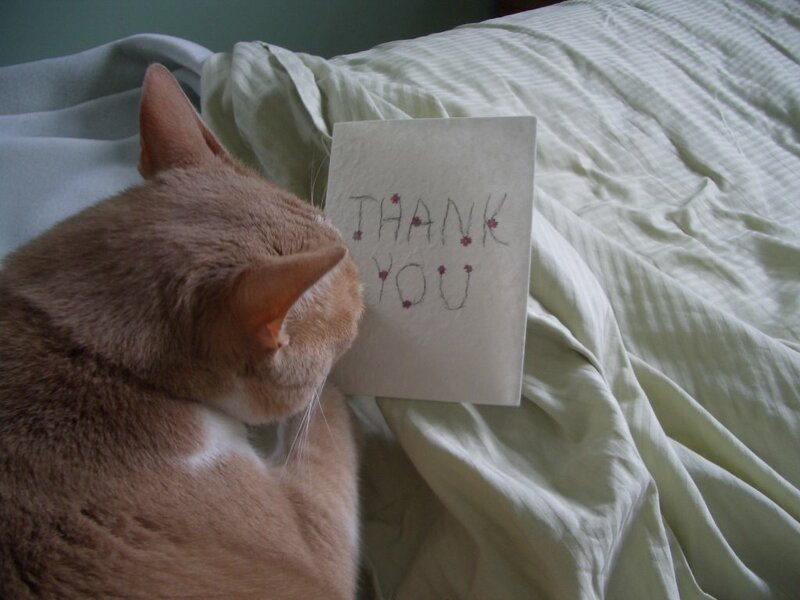 Many thanks to all of the organizers of the Catolympics, fur kids and beans. Beau, The Calico Girls, all of the competitors and everyone who help in any way. It was a fun time (most important) and the competition was good and close. So Grampie will be here soon and we can celebrate. Happy Father's Day to all of the dads out there. I will be resting up from my busy weekend. Had a comment from Opus and Roscoe, our American kitties in Italy. They have been away from all of this. 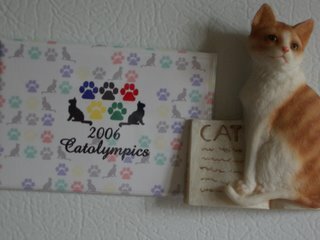 You can read up on the Catolympics here. 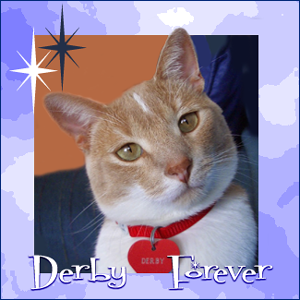 Derby: Mum, I need to get to the Catolympics, come on. I gotta go, I will miss stuff. Derby's Mum: Relax Derby, I just got home from work. So please give me a few minutes to put down my stuff and change clothes. You don't need to be there for another hour. DM: OK, lets make sure you have everything you need. I guess you do. So just a few words from me. First, do your best. Make sure you warm up and stretch before your events. Second, be gracious, win or lose. Third, be fair on the events you are commenting on. Don't give extra attention to your friends. You don't have to teleport home until after the event is over. But I will make sure there is fresh cool water and crunchies out for you, in case you pop home. Remember Father's Day is Sunday, so be home so you can help Grampie celebrate. So get ready to teleport. Mum gotted all of the little kitties ready and tooked them to the station tonight. She boughted their tickets, wished them well and kissed them good bye. They are all now on their way to their new homes. 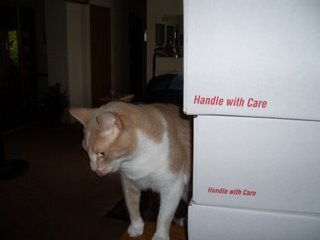 Here I am checking out the travel boxes for them. As you can see it says "handle with care" some furry precious guys are inside. 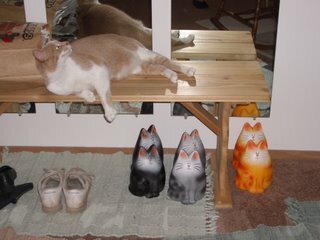 Kittie kisses to the little guys from me, Vir-ginger and mum. Good Bye and Good Voyage! Plus very good news that Edselsmom is home and recoverying after surgery. Continuing good kittie vibes for a speedy recovery. 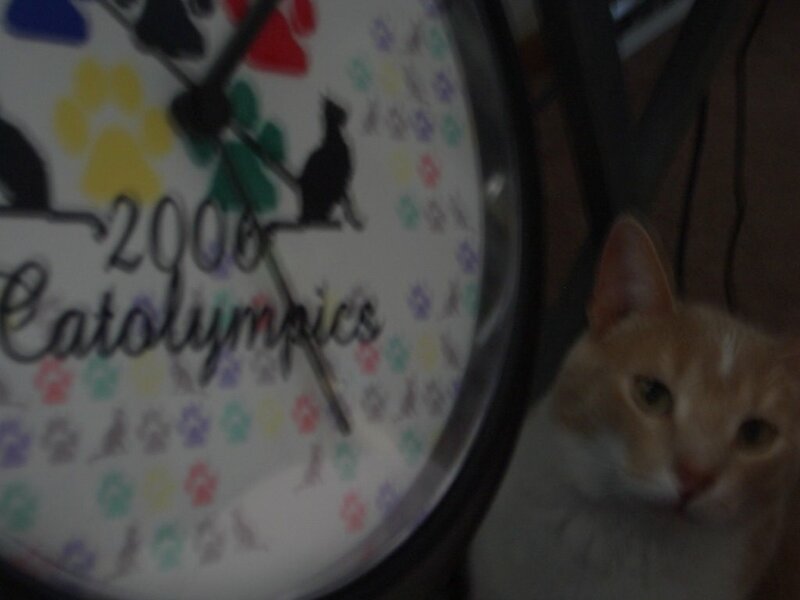 Lastly, the torch for the Catolympics has made it to the Big Piney Woods. Tomorrow night is the opening ceremony. Can't wait. Tonight Mum made progress in getting the little kitties ready to go to there new homes. They have all been tucked into there travel containers. All travel papers have been finished. Now mum just needs to get them off on their journeys. We must have some smart kitties, three of them are going to Texas, one to Florida, one to Mass-choo-sits and one all the way to Great Britain. We will e-mail everyone when the kitties actually leave on their trips. Plus a quick picture of PFE, he looks good with his flowers. First, Edselsmom's surgery wented very well. YAY. 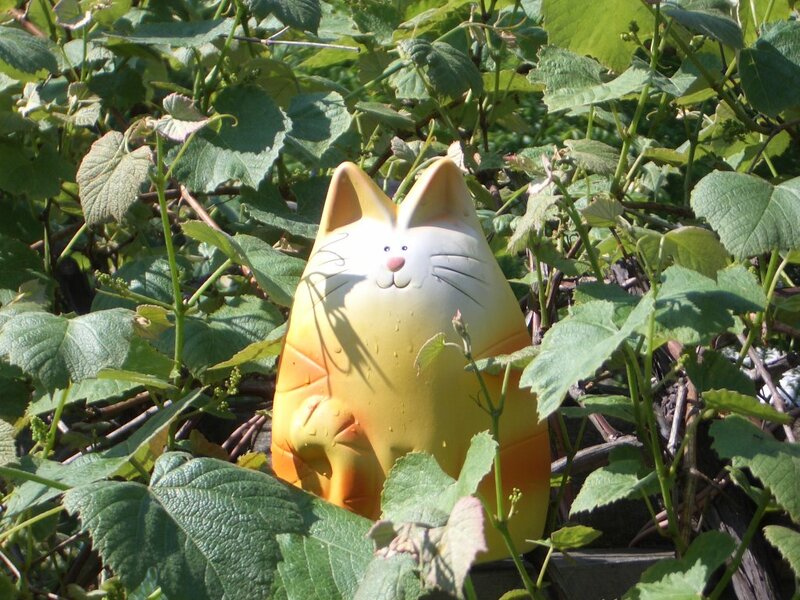 So lots of continuing kittie vibes for for a complete and speedy recovery. Drop by and leave a message. 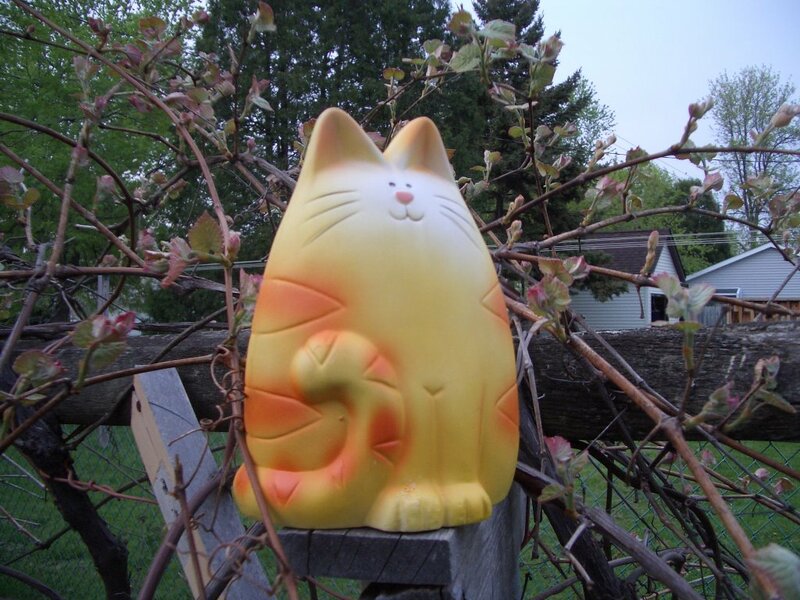 The Poiland Gang wants a Vir-ginger type kittie. Mum says she will go and check around to see if she can find one. 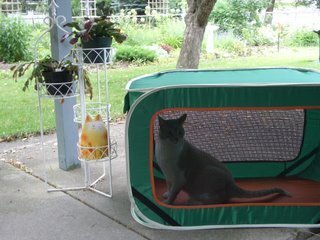 The close Green Walls Shelter is out, but mum says they have lots of shelters in the area. So stay tuned. 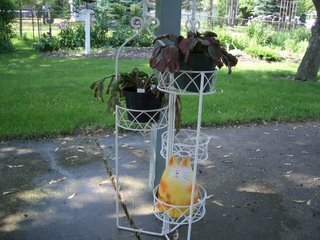 The gang at Feline Oligarchy had a question on the plants pictured in the last post. 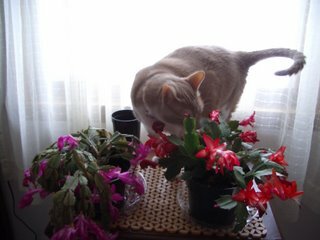 Yes, they are both what mum terms Christmas cacti. But they are different colors. The one you are asking about is the one on the right. Sort of a coppery color. Mum used to have a white one too. 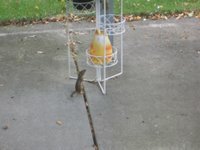 But the squirrels gotted it last summer and killed it. 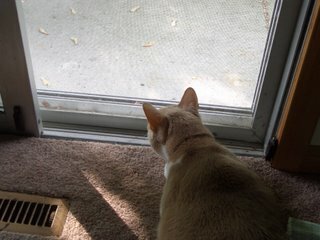 So Vir-ginger has to guard these to keep those little furry guys away. Guess that is it. I have been backing off now on my Catolympic training. I did a bit of jumping and running today, but not much. Mum says I need to ease into the weekend. Keep doing my stretches, eat well and be rested. 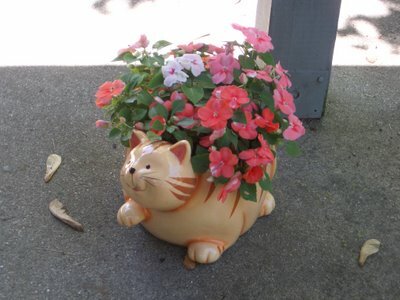 This is for Bonnie Underfoot & Victor Tabbycat's mom. Mum moved her Christmas catci outside in late April. Mr. Jack Frost has stayed away and they will stay outside until Mr. Frost comes back in the fall. Mum says this helps them bloom better. As you can see, Vir-ginger is on guard keep the plants safe from little outside furry creatures that might want to eat these plants. That would make mum furry unhappy. Grampie came over this afternoon and mum fixed dinner by cooking outside. 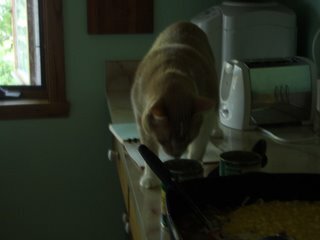 While she was standing waiting for stuff to cook, a hummer came by. No, not the big noisy thing with wheels, but a cute little flying hummer. It was feeding at the hanging baskets of impatience. Mum loves these little birdies and seeing them fly and feed. They are furry wonderful to see. Mum didn't get anywhere with arranging the travel for our adoptees. I will keep you posted. Many thanks to Oreo for hosting such a wonderful party this weekend. I have asked mum if I can host a party for all of the October kitties and she said YES!!! So put the weekend of Oct 20-22 on your calendar now. Details to follow. Please joing the prayer chain for Edselsmom tomorrow. Times are at the Calico Girls site. Found me a higher spot to rest and check things out on a nice lazy, Saturday. I have done my early morning practice for the Catolympics. A bit of running and some practice high jumps. Mum was trying to get pictures, but when she broughted out the flashy box thing, I quit jumping. hehehe. Can't give anything away. However, mum is not 'alaxing. She has got the big clothes washy thing going in the dungeon, she has been to the store to buy food and treatsies, readed the paper, vacuumed the house and took care of the birdies food too. Phew. She is hoping to get time to work on getting all of the shipping things ready for all of the little kittie guys. We will miss them, but are furry happy that they are going to good homes. Here you can see they were gathered by the bench. I was keeping watch on them to make sure they were doing OK. Mum hasn't allowed them outside, as she is afraid they mighted get lost and we don't want that to happen. Guess I will pop over to Oreo's party a bit later. Didn't stay very long last night. I wanted to spend some time with mum. It was a cool night here and I knew she would need her warm little snuggle guy. 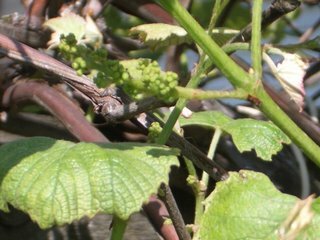 Mum has a big vine, she says it is a grape vine. She likes it 'cuz when it is growing in the summer you can't see next door. So she can sit on the patio and have privacy. This is what it looked like the first week of May. The leaves were just beginning to open up. This is Vir-ginger sitting in the same spot now. The leaves are really getting big. 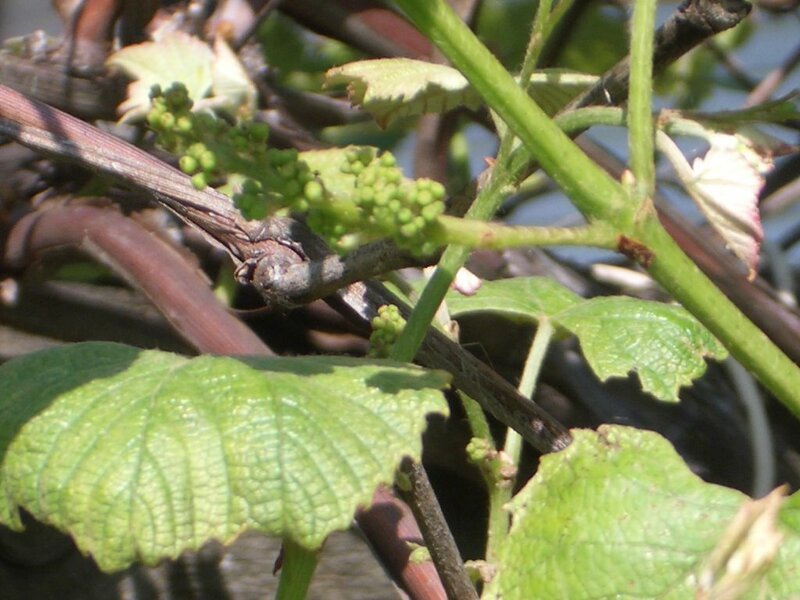 And if you look at those little round green things, mum says those will grow up and be grapes that can be eaten. Mum says if she hadded time she could make jelly or wine, but she justs leaves them for the birdies to eat. They ated all of them last year. Plus mum putted in the last of the big plants tonight. Two honeysuckles and two butterfly bushes. 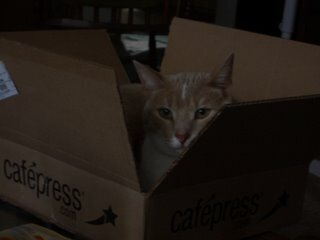 Plus she wented to the store to get the proper shipping stuff for the little kitties. So she gots to work on that over the next few days. Now maybe mum will have more time to snuggle with me. Recently one of Vir-ginger's litter mates, Charcoalie, got adopted by Bonnie & Victor and they are fostering a few more. Bonnie and Victor have already sent two kitties to live with The Calico Girls. Crew's View has one as well. 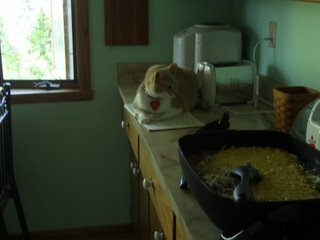 Vir-ginger was happy to see that some of our Whiskconsin furends were fostering so Vir-ginger came to me for a chat. So after we chatted a while, I wented to mum and asked if she would go check and see if the rested of her litter mates got adopted from the Wall Greens Shelter near us. And if they hadn't would she please bring them home to live with us? Or at least live with us for a short time until we could see they gotted good homes? I know some of our blogging buddies might be interested in having one. Mum said she would go and look, but thought that it might be hard to find out where all of them got adopted out to or even if they had been adopted. But she would try. 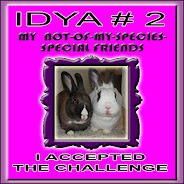 Good news, almost every one had been adopted, and mum broughted home the last few. From left to right. Woohoo, we gots a big party kitty group now for Vir-ginger to play with outside, at least until we finds them homes. Mum says at this point we are reserving Mandy for Fat Eric. Mango is my gift to my dear Princess Mia. But that leaves four more kitties who need a home. 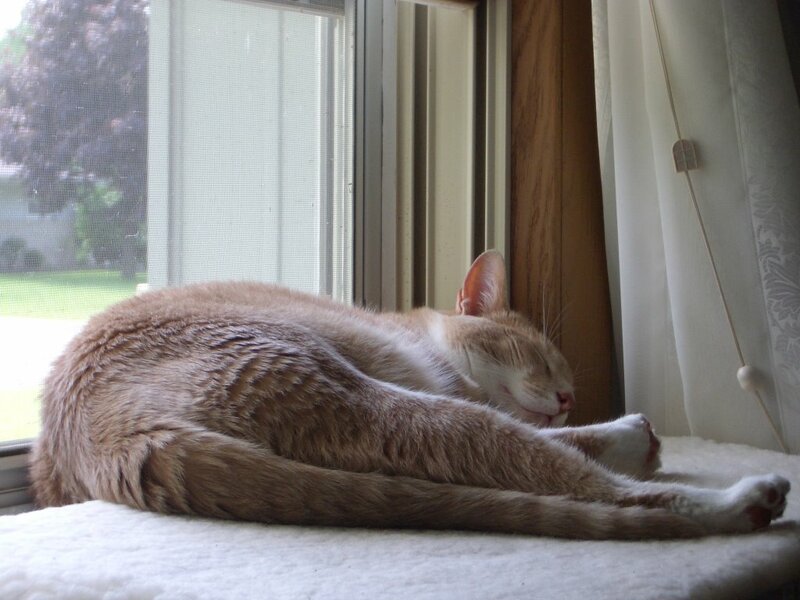 It has just been a good day to be in the window and nap. Some of you have asked what shelter mum founded Vir-ginger. It is a US shelter called Wall Greens. It has all sorts of stuff for people and poodins too. So check and see if you have a Wall Greens in your area. See if there is any kitties that still need homes. Vir-ginger has founded one her little brofurs. He got adopted by Bonnie Underfoot & Victor Tabbycat's family. His name is Charcoalie, Vir-ginger just calls him Charcie. So Vir-ginger is sending lots of good vibes to him. She hopes that the rest of her littermates all ended up in good homes as well. 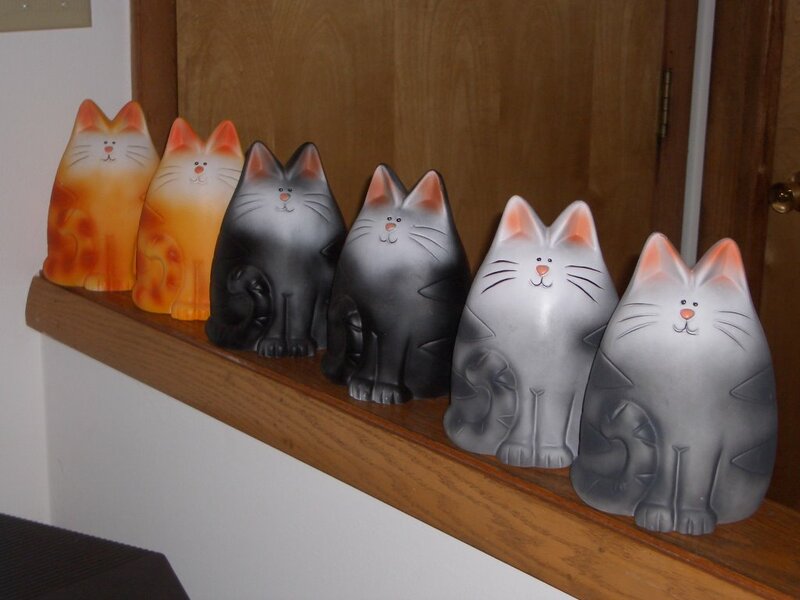 A couple more are on their way to live with the Calico Girls. Crew's View says they have one too. Do you have one of her litter mates? Vir-ginger would love to know if you do, she says she was one of a HUGE litter. She said there was squillions in her litter. 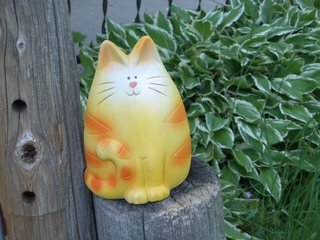 She is sitting out front on the post, with her usual big smile. Waiting to hear from her littermates. P.S. I am fine after my issues from the other day. No more mishaps and mum thinks I probably have all of my nine lives. Phew, I hope to stick around a while. But the good thing, at least for now, NO COLLAR! Thanks to all those concerned about my last post. I am OK, and mum didn't actually do anything to me. So not a whisker or hair was harmed on me. No cuts from the glass. So I don't need a spot to hide out at. She was just thinking of caticide. Yesterday was just not my day. More fun things happened much later in the day. Mum wented to work as usual during the day and I hung out and napped at home, watched the birdes and such. When mum gotted home she worked outside, mowing the grass. Then she wented out to the store and bought some birdie food and a few other small items. Mum was just sitting on the couch watching a little TV before going to bed. I grabbed at the empty bag, so she let me have the paper bag to play with. I was having so much fun with it. But somehow I must have moved my collar with my paw and it ended up, still fastened but around the back of my head and in my mouth. It was over my teeth, so I couldn't get it to slip back. Then I started gagging like crazy. Mum was right there, but I was a panicky and didn't want to let her me help me at firsted. 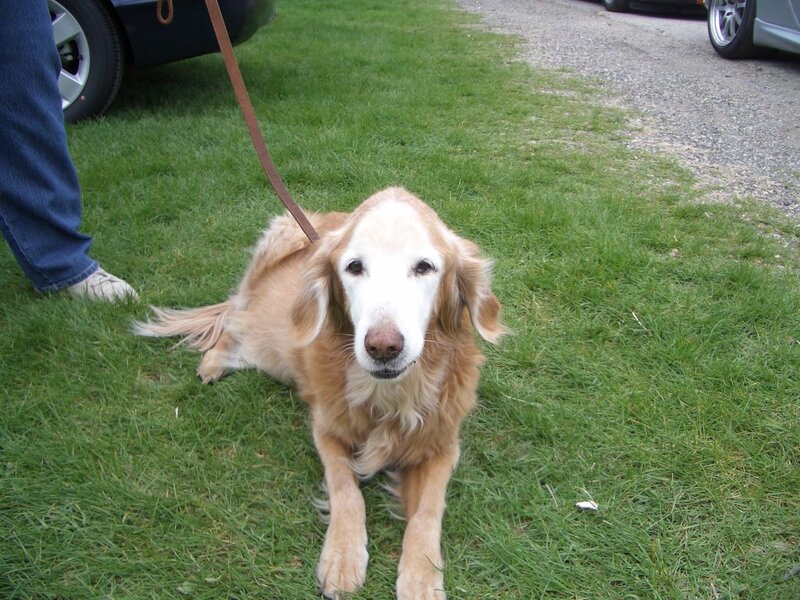 But she gotted me in a good hold, saw what the problem was and manged to get the collar off quickly. Thankfully she only uses collars with the quick snap disconnect, all you need is a really good pull, and they come open. Phew, mum to the rescue. She letted me go as soon as she had it off and for now she has left my collar off. So I know mum loves me, otherwise I might be down to 7 lives now. Thanks mum.